To truly understand someone, you must walk a mile in their shoes. This is why Masonic Village Hospice has begun pairing patients who are veterans with veteran volunteers. Some veterans near the end of life face challenges including post-traumatic stress disorder and survivor’s guilt. In addition, they can face health setbacks from their time of service, including chronic pain, presumptive diseases that are associated with exposure to wartime chemicals and traumatic brain injuries from accidents, falls and explosive devices. Veteran volunteers have the unique ability to relate and connect with these patients, encouraging an environment where life reflection and healing may take place. Many veterans don’t consider what they did to be heroic. They believe they simply did what they were asked to do for their country. However, hospice feels it’s important to honor these veterans, who have lived so selflessly, at the end of life. 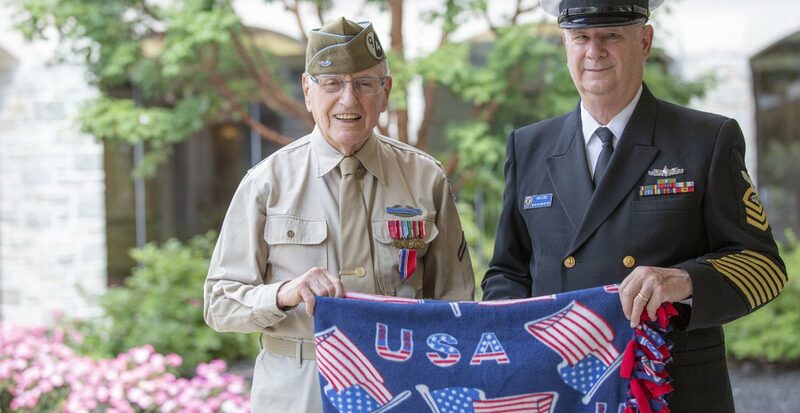 Volunteers (pictured) Herb Ridyard, a World War II Army veteran, and Larry Wolford, retired from 30 years in the Navy, conduct ceremonies in uniform for fellow servicemen and women receiving hospice care. The two have conducted well over 300 ceremonies since 2014. The ceremonies include a special reading, a pinning and the presentation of a certificate and a handmade red, white and blue fleece blanket to the patient. These are moments of recognition and validation for veteran patients that come after a long life of internal strife for some. If you’re a veteran, or currently serving, and are interested in improving the final days of another veteran’s life, contact Masonic Village Hospice’s Volunteer Services at 717-367-1121, ext. 33024. Volunteer hours are flexible, and any amount of time you can give will truly make a difference.